« Of course, we had thunderstorms… » Jacques Brel used to sing. In late May this year the whole of France was plagued with thunderstorms; bur thank God, in Toulouse, we were lucky enough to escape them. 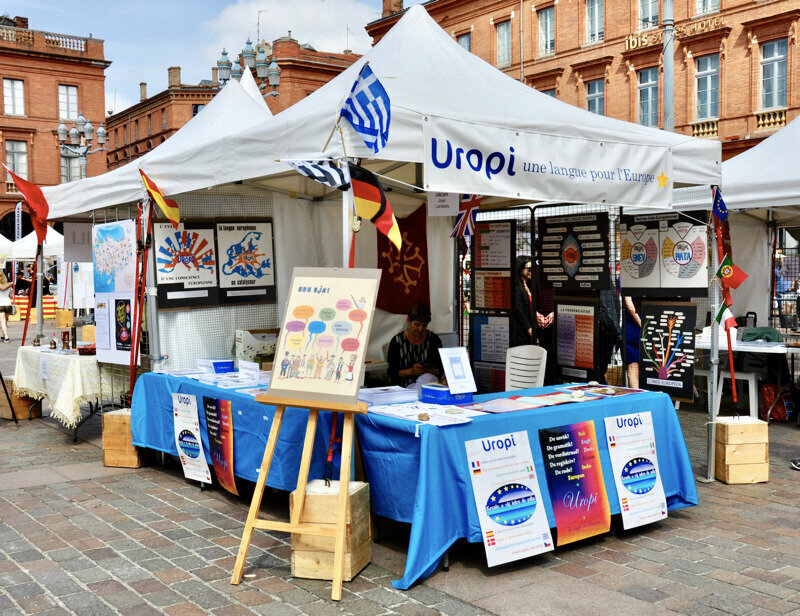 On Sunday May 27th, on Place du Capitole, the sky was cloudy with sunny intervals, at 8 am, when we put up our stand. The morning was rather quiet before the visitors’ rush, which left us time time to stroll around the Forum and halt for a chat at various stands, for ex. 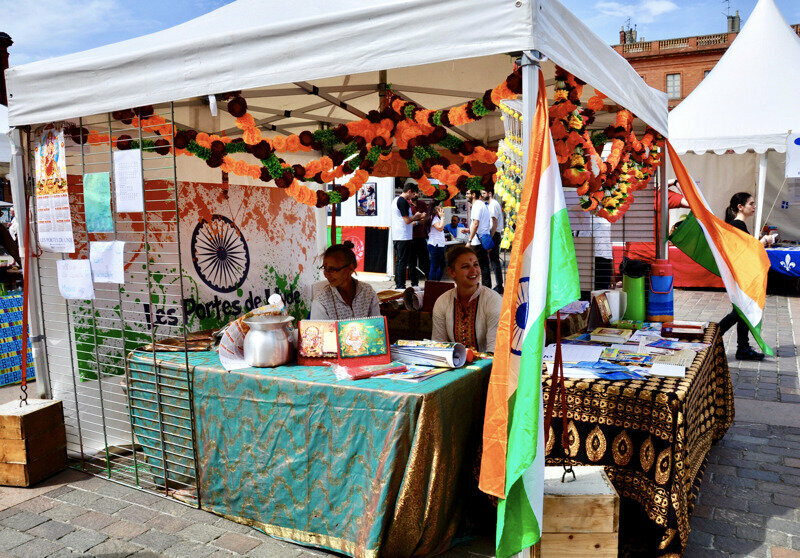 the highly coloured Hindi stand, the Thai stand, the Wolof stand where I talked to a Senegalese and his companion. He was from Thiès, the town where I lived down there. I told him that I had learned Wolof but that I had forgotten nearly everything except salutations, and we exchanged memories on ‘our town’. I also spoke a little Russian at one of the 2 Russian stands where they gave me sweets, and talked with a Swede on the next stand (see below). I also popped over to the neighbouring Chinese stand to check the pronunciation of a few Chinese words I intended to use as examples. Then our friend Gérard arrived from Paris and was a great help to us later to explain Uropi when we were overwhelmed by the flood of visitors; we also had the pleasure to see our friend Henrìk from the Casal Català. In the afternoon the air got very hot and stuffy, fortunately, a light wind started blowing and did us good. Then the stream of visitors began; more than a stream, it was rather a tsunami: we didn’t know which way to turn and barely had time to breathe. Some people had to be content with listening to what we said to the others and take our Internet addresses. Who were our visitors ? A man with a master’s degree in sociology was very enthusiastic about Indo-European. He thought that each language determines a worldview (I don’t know whether he took part in the afternoon debate dealing with this very topic). He said that ‘English’, or rather Globish, could not be a universal communication language. A student in sociology and economics thought that Uropi could be a means of communication which would not supplant other languages. We saw a certain number of engineers and engineering students. One of them had a four-month work experience in Russia; he felt the need for a communication language because, he said, Russians don’t speak English, or very little. Toulouse is the aerospace capital in France and has many exchanges with Russia. Russian engineers come and work for, or have a work experience with L’Aérospatiale, and French people go to Russia. This year we met many Russians on the Forum (among whom those working for L’Aérospatiale). Jürgen E., a Russo-German engineer was very interested in Uropi: he was well informed about Indo-European and told us about the genetic research which would enable us to trace the precise routes of Indo-European migrations. His girlfriend, a Russian too, was touched to see the Uropi translation of Дама с собачкой (the Lady with the dog) by Chekhov. They were all subjected to the pronunciation test: we asked them to read a sentence in Uropi, generally the title of one of our booklets. Not only did they pronounce it perfectly, but they also spontaneously stressed the words in the right place. It was a real pleasure to hear them and they were applauded. It must be said that 33% of young Italians are unemployed, even in Northern Italy, as a girl from Novara told us. 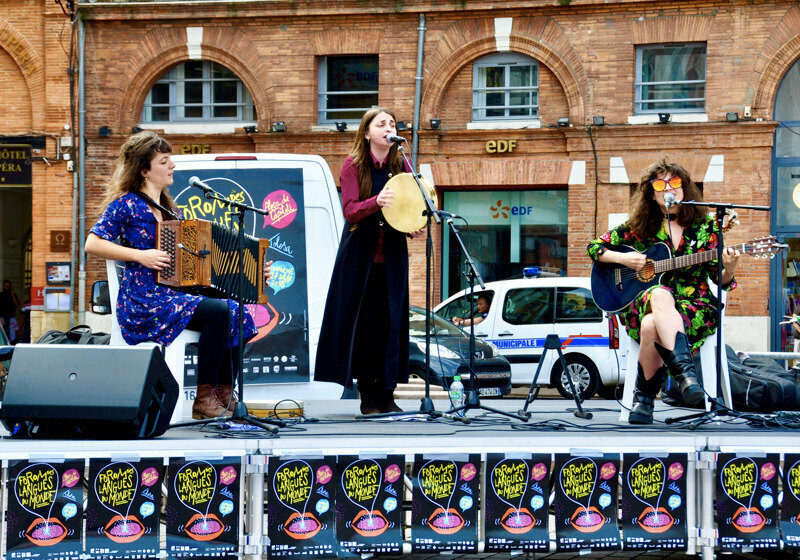 Thus many of them have to leave their country to find a job, for instance in Toulouse. Those Italian expatriates found they had problems to communicate. They were also afraid of the rise of nationalism in Europe. An Italian-speaking Frenchwoman was worried about the situation in Italy; she asserted that Europe will not be saved without a common language. We could not agree more. A Chinese from Hââng Kââng with whom we discussed in English (it took me some time, going over Chinese provinces in my mind, to realize that he came from Hong Kong), was one of the rare advocates of English as an international language. We also met a Vietnamese accompanied by a Russian and a few others. With a Japanese we spoke of ‘pan-ya’, bakery in Japanese which is almost the same as Uropi ‘pan-or-ia’. I explained to him that in Uropi ‘pan-ia’ would be the ‘place of bread’, whereas ‘panoria’ is the place where a baker (panor) works. We also explained that the Uropi present tense was very similar to the Mandarin one, insofar as both languages use the invariable verbal base with all the persons, for ex. to speak: wǒ, nǐ, tā, wǒmen, nǐmen, tāmen shuō = Ur. i, tu, he, nu, vu, lu vok… Both languages also form compounds similarly as in dēngtǎ (lamp + tower) = Ur. lucitòr (light + tower) = lighthouse. 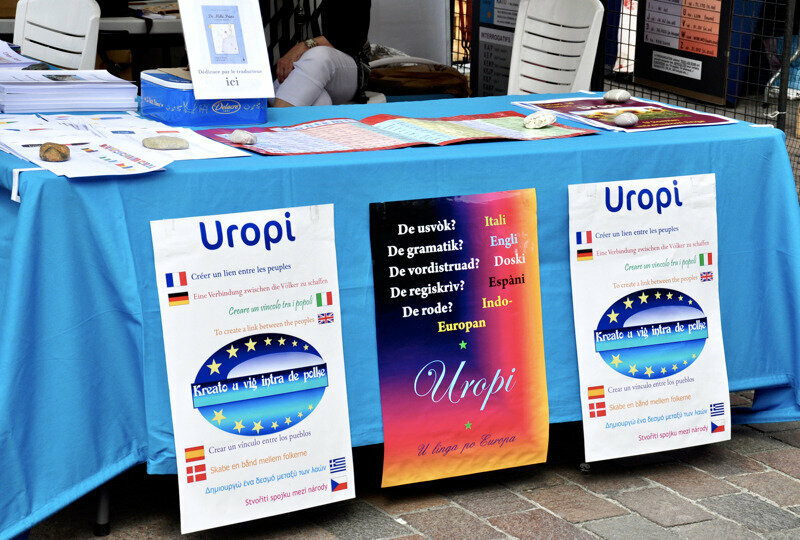 A Spanish teacher from Bolivian origin asked us how Uropi was built. We also met many Spaniards. He writes poems using words of different languages; we had planned to meet again to carry on our discussion, but unfortunately the flood of visitors did not give us the time to. also came to visit us: first a man alone, then a whole family with grandmother, mother and children, then a couple of young men. They were all attracted to the poster « I liam ta » (I love ou) in various languages and looked for the Bulgarian equivalent: ‘Obicham te, obicham te’ they chanted. Esperantists, a Toki-Ponist and an Occitan Castilian teacher. They were few: 3 or 4 at most. We called them ‘hidden’ Esperantists because they didn’t introduce themselves as such, but beat around the bush. Why ? Why not lay one’s cards on the table ? We have never refused to discuss with Esperantists. One exception was a woman who said she was an Esperantist right away; she was curious about the way Uropi words were built. The Toki-Ponist came to us because he had seen our advertisement on the Internet. He claimed that 100 words, as in Toki Pona, were enough for an International Auxiliary Language. Well, they may be enough to get food, drink and accommodation, but what if we want to go further ? Could we translate G. Orwell, M. Yourcenar or Alice in Wonderland, Baudelaire’s or Hermann Hesse’s poems with a hundred words ? We replied that « Who can do more, can do less » and that, from the 20 000 Uropi words, you can be content with learning some hundred terms. 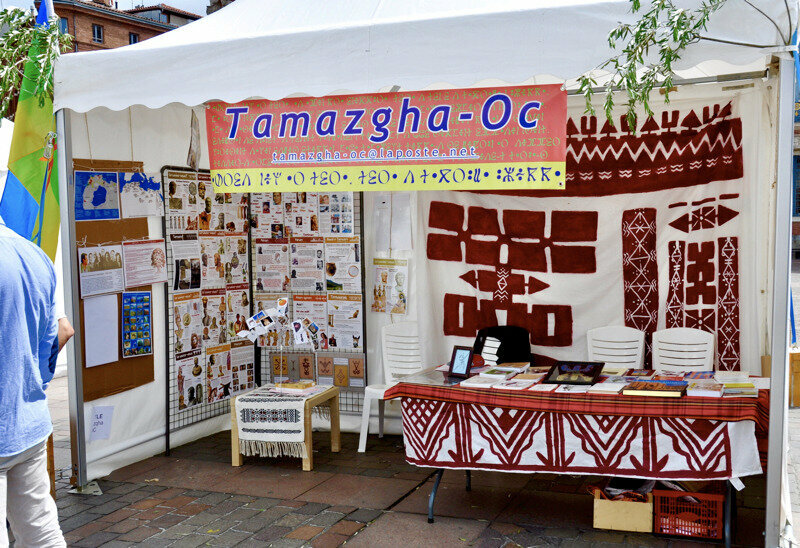 The Occitan Castilian teacher held the opposite point of view: he rejected the very idea of an international language and told us he had refused to learn English or Globish. For him, each language means a culture and everyone should learn the language of the countries he visits. We pointed out that not everybody can learn so many languages and that many people have difficulty learning only English. He wasn’t convinced: for him it is a question of willpower: to learn any language, you only have to decide to. A Basque association from Bayonne, Euzkal Babel, wanted to develop language diversity and promote language learning and exchanges. 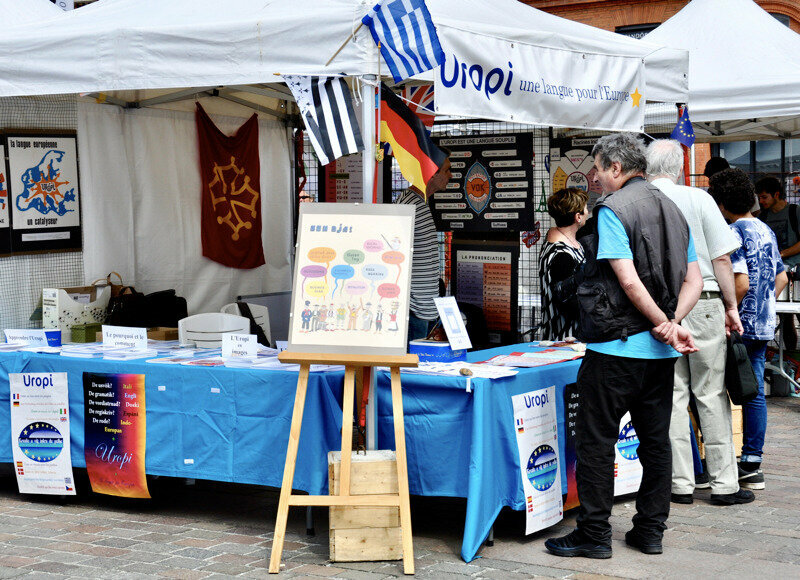 In the association Elles marchent64, MJ A. was persuaded that a common language for Europe is an absolute necessity if we want to perpetuate the European Union: « Being interested in and loving the language means you are interested in and love the people. » she said. Walking around the Forum was for her a Grand Tour around the world. I explained to them that we all have a multiple identity (Edgar Morin’s Unitas multiplex) and that we may well feel Alsatian, French and European and why not citizen of the World… simultaneously. 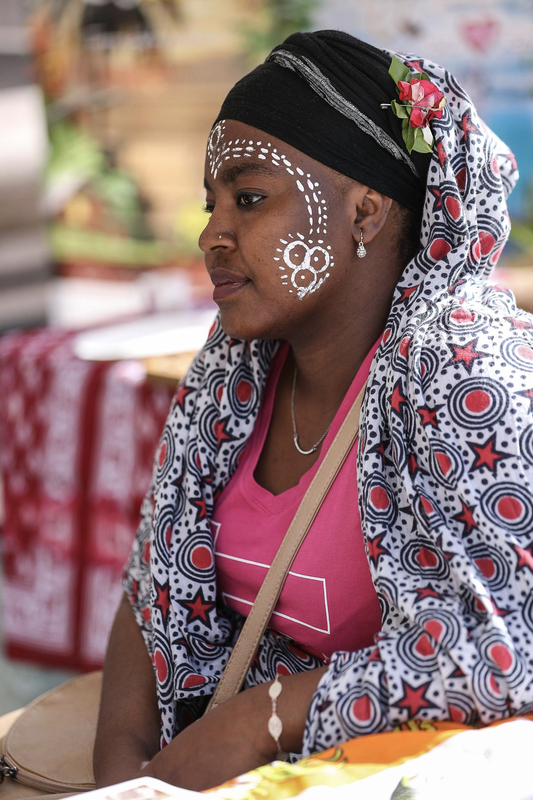 Before she used to live on a sailing boat with her husband and they travelled a lot, being in contact with a great variety of languages; she felt that Uropi was a necessity as a communication language. Another lady whom we had never met before, put forward all the arguments that are usually ours. Uropi seemed to her obvious: she mentioned the need and the urgency to bring the peoples of Europe together; a common language would be the cement ensuring their cohesion. One should avoid the hegemony of one single national language. 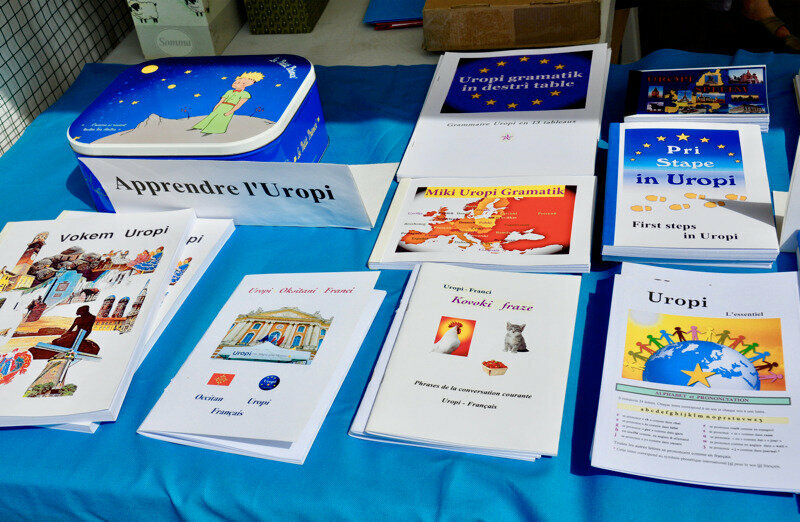 The union of European peoples should be based on mutual respect for all and thus respect for their languages; therefore we need a common language which takes this diversity into account. Uropi, from the very way it was built reflects the diversity of the languages spoken in Europe: it is an obvious choice. We couldn’t dream of a better ambassador for Uropi. Towards 7 pm we had the pleasure of meeting Marion G. who lives in New York and is the founder of the Barden Project and Barden Linguistics in charge of developing language exchanges. She wanted to add Uropi to her language list. We had unfortunately little time to talk to her because we had to put our things away, but we said we would keep in touch. More and more people had already heard about Uropi either on the Internet or on previous Forums, like that friendly grandfather with a broad smile and mischievous eyes who explained Uropi to his grandson by himself. Most visitors were impressed by the quantity and quality of the work. « What a work! » was a recurrent exclamation. More and more people feel the need for a constructed language as a means of international communication. We could observe a growing lack of interest for international English or Globish (was there a link with Brexit or Trump’s coming to power ?) A student considered that English wasn’t a communication language and that we needed a more simple language. Engineering students said they had lessons in English and were even obliged to communicate in English with each other, which led to a great frustration because the language used was flat, dull and savourless. Only two of our visitors spoke in favour of international English: the Chinese from Hâng Kâng and a lady from Toulouse who didn’t give us any argument. Of course I told them how, at the age of 16, I came across the Dictionary of the roots of European languages by R. Grandsaignes d’Hauterive. We had to explain what the common roots were because many of them had never heard about Indo-European. Taking a few examples like mother or sun, we showed them how the I-E roots *méhₐtēr or *séhₐul can still be found today in most I-E languages. « So, how do you say ‘sun’ in Uropi ? We also insisted on the modern and simple aspect of Uropi words as compared to the complex I-E roots (with laryngeals, etc. see above and below). Proto-Indo-European was, so to speak, a kind of old grandfather for Uropi (in German, Ur-Opi means great grandfather), an ancestor full of wisdom who passes on his mysterious knowledge to his grandson, i-e the Indo-European roots. As a matter of fact, Uropi meant ‘European’ in old Uropi and this is what the word means today in Maori: ūropi. We also explained that Uropi was a democratic language: the majority wins. For example, there are at least two I-E roots for ‘water’: *hₐekʷehₐ- (which gave ‘aqua’ in Romance languages) and *wódr̩- which we can find in Slavic (voda), Baltic (vanduo) and Germanic (water, vatten, vand…) languages, in ancient Greek (hudôr) and also in Romance languages (onda, onde = wave), that is in about 30 languages as against 6 for ‘aqua’, hence Uropi: vod. It is similar to a simplified English grammar. The verb in the present works like a Chinese verb (see above). Adjectives and participles are invariable; there is no subjunctive. From the rich Indo-Eruopean declension system Uropi, like English and the Scandinavian languages has only kept the genitive which is also used to form adjectives and compounds. For instance: sol > soli (sun > sunny, sun-), u soli dia (a sunny day), soliflòr (sunflower). We were not particularly keen on speaking about Esperanto, but we couldn’t refuse to answer either. We explained that the first difference was in the choice of words. 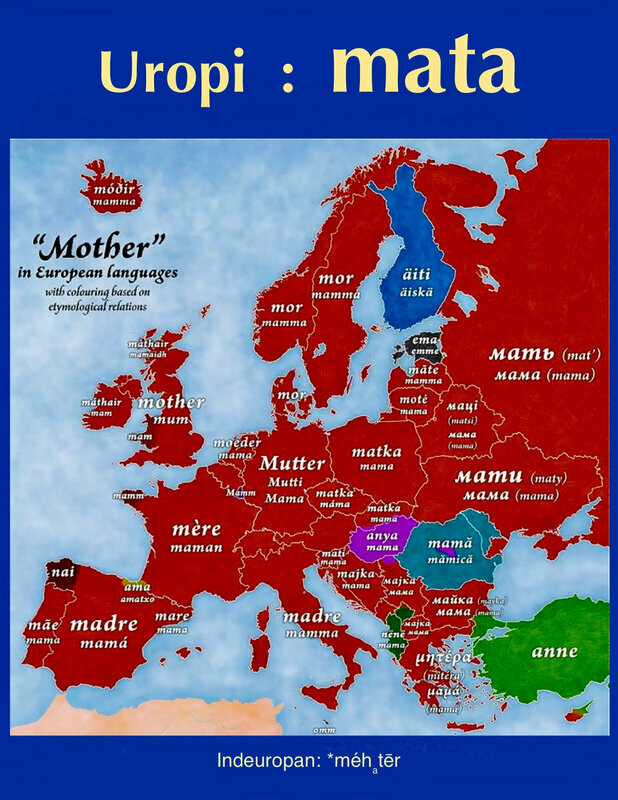 Uropi chooses the most common words in I-E languages like vod (see above) or sol (= the sun, from Spanish or Swedish sol to Greek hêlios, from Russian solntse, to Hindi sūraj, from Lithuanian saulė to Breton heol…). Esperanto, on the other hand, seems to pick up its words from European languages at random, for example the word birdo, from English 'bird', but which doesn’t exist in any other language and whose origin is rather obscure, or knabo (boy, borrowed from German Knabe which is no longer used in modern German) or pomo (apple, from French pomme, which exists only in French and Catalan, because pomo in Italian means ‘fruit’ like Latin pomus). On the contrary, the I-E common root *h₂ebōl gives ‘apple’ in 29 languages, hence Uropi apel. Of course Zamenhof can’t be blamed for ignoring Indo-European which was brought into light later. The I-E root *hₐewei- for bird can be found in few modern languages: Latin avis gave Spanish and Portuguese ave, au in Catalan, and words like avicole, avion in French. The Latin diminutive: avicellus, little bird, gave Italian uccello, Catalan ocell, Occitan aucèl and French oiseau (from old F. oisel). The I-E root also gave Breton houad and Welsh hwyad (= duck) and Armenian hav (= hen). This is not much. But we reassured our visitors: the etymology of Uropi words is rarely as complicated as this. we can say that we found a change in the atmosphere of the Forum as far as Uropi is concerned: the questions asked and consequently our answers were more concrete, less theoretic, ideological, perhaps less technical, but certainly less polemical. The need to find a concrete solution to the problem of international communication through a constructed language was more often mentioned. Several visitors said about Uropi: « But it’s the obvious solution! » Strangely enough, it doesn’t seem to be obvious in Brussels. Some people felt rather sad and even anxious about Europe which seems to be disintegrating and thought it was urgent to find a cement to hold European peoples together. « Only a common language can do it » said one of our visitors. We could also feel, concerning Uropi and the ideas it carries along, a more ‘sentimental’, more emotional, less intellectual interest: a need for hope, not to say for ‘esperanza’. After 7 pm, at the very moment when we had to pack our things, we were stuck in a traffic jam in the underground car-park, but fortunately we were able to load everything into the car just befoire the first raindrops started to fall. We were exhausted but happy about the rich and frank exchanges we had with this « world in miniature ». We were safe and sheltered in the car when the downpour hit the town.